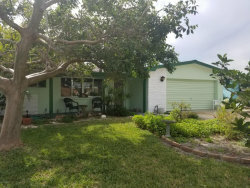 Great Opportunity to own a well-maintained home situated in a sought after Satellite Beach neighborhood! Just a short walk to the Beach and the nearby Surfside Elementary, this charming home features 3 Bedrooms and 2 Baths, a 2 Car Garage with an additional Storage/Shop area, Inside laundry, Guest Bedroom w/Slider, Eat-in Kitchen with Slider leading out to the screened porch. Enjoy the Florida Sea Breeze while overlooking the spacious back yard with mature landscaping. Some additional features include Updated Double-Pane Windows (2013), Roof (2006), AC (2014). Don't miss this one!